By Keith Cowing on November 30, 2015 7:02 PM. "The three left XCOR to found a new company, Agile Aero. That company, which, like XCOR, is based in Midland, Texas, will be focused on addressing a problem Greason says has afflicted XCOR and other aerospace companies: the inability to rapidly develop and test vehicles, be they high-speed aircraft or launch vehicles. "We've seen so many companies run into the same obstacle," he said in an interview. "Once you get past cylindrical designs into vehicles that have lift in the atmosphere, the complexity gets to the point where the ability of people to try things rapidly, and succeed or fail fast, runs out of steam." "Greason noted that the past few years have seen a dramatic uptick in the pace of development for small satellites and rocket engines, but that "nobody has had much luck with rapid-prototyping [advanced aerospace] vehicles, except for making missile shapes." "We don't know exactly how to do it yet, but we have a clear understanding of the challenge," he said." "XCOR Space Expeditions announced that it will raise the price of a flight aboard XCOR Lynx from $100,000 to $150,000 effective January 1st, 2016." Keith's note: So ... the guys who founded and ran XCOR are leaving XCOR to start a new company that will solve the problems that they could not solve at XCOR. It does not seem like they have a good track record in that regard (both DeLong and Greason had prominent roles at Rotary Rocket). Just sayin'. By Keith Cowing on November 30, 2015 4:42 PM. "According to NASA and some space historians, the message in the response that Clinton claims to have received is consistent with NASA policy and the agency's attitudes toward the possibility of female astronauts at the time. It is debatable whether the tone of the letter Clinton describes fits NASA's response to girls or aspiring female college students in the early 1960s. NASA could not authenticate the one 1962 letter that exists in cyberspace that appears to confirm Clinton's account, though the agency says it has no reasons to doubt it is a genuine NASA letter." Keith's note: No comments are being allowed on this election 2016 post due to prior commenter behavior. Please do not try and post them elsewhere. By Keith Cowing on November 30, 2015 1:10 PM. By Keith Cowing on November 28, 2015 3:02 PM. "Planetary Resources, the asteroid mining company, applauds President Obama who signed the U.S. Commercial Space Launch Competitiveness Act (H.R. 2262) into law. This law recognizes the right of U.S. citizens to own asteroid resources they obtain and encourages the commercial exploration and utilization of resources from asteroids." "My view is that natural resources [in space] should not be allowed to be appropriated by anyone states, private companies, or international organizations," said Ram Jakhu, a professor at McGill University's institute of air and space law. He said the 1967 Outer Space Treaty, signed by the U.S. and other countries, including Canada, makes it clear that the surfaces and contents of asteroids and other celestial bodies are protected from commercial harvesting." "If asteroids cannot be appropriated by any state, they can also never be owned by a company, and that includes parts of an asteroid that might be extracted. Any notion of property law which would allow a person to possess, use or sell an object, depend upon the existence of a sovereign jurisdiction. The U.S. cannot give away what it does not own." "It remains unknown whether the unilateral move by the U.S. to claim space ownership is valid. According to the Outer Space Treaty, signed by the U.S., Russia, and a number of other countries, nations can't own territory in space. "Outer space shall be free for exploration and use by all States," the treaty says, adding that "outer space is not subject to national appropriation by claim of sovereignty, by means of use or occupation, or by any other means." The new law, however, does include a very important clause, as it clarifies that it does not grant "sovereignty or sovereign or exclusive rights or jurisdiction over, or the ownership of, any celestial body." By Keith Cowing on November 25, 2015 9:44 AM. "Rep. Lamar Smith (R-Tex. ), chairman of the House Committee on Science, Space and Technology, has subpoenaed scientists at the National Oceanic and Atmospheric Administration and demanded that they turn over internal e-mails related to their research. Their findings contradicted earlier work showing that global warming had paused, and Smith, a climate change skeptic, has accused them of altering global temperature data and rushing to publish their research in the June issue of the journal Science." "AAAS and a half-dozen other leading scientific organizations on Tuesday expressed "grave concern" about a Congressional inquiry that has unfoundedly called into question the integrity of federal scientists whose research, published in Science, seemed to debunk claims of a global-warming slowdown or "hiatus." In a letter to Rep. Lamar Smith (R-Texas), chairman of the U.S. House Committee on Science, Space, and Technology, the group acknowledged the importance of appropriate congressional oversight of federally funded research, but emphasized that "scientists should not be subjected to fraud investigations or harassment simply for providing scientific results that some may see as politically controversial." By Keith Cowing on November 24, 2015 10:33 PM. By Keith Cowing on November 24, 2015 9:25 PM. "Katherine Johnson once remarked that even though she grew up in the height of segregation, she didn't think much about it because 'I didn't have time for that don't have a feeling of inferiority. Never had. I'm as good as anybody, but no better.' "The truth in fact, is that Katherine is indeed better. She's one of the greatest minds ever to grace our agency or our country, and because of the trail she blazed, young Americans like my granddaughters can pursue their own dreams without a feeling of inferiority." "In 1953, after years as a teacher and later as a stay-at-home mom, she began working for NASA's predecessor, the National Advisory Committee for Aeronautics, or NACA. The NACA had taken the unusual step of hiring women for the tedious and precise work of measuring and calculating the results of wind tunnel tests in 1935. In a time before the electronic computers we know today, these women had the job title of "computer." During World War II, the NACA expanded this effort to include African-American women." By Keith Cowing on November 24, 2015 5:57 PM. "We congratulate Blue Origin on the progress they're making with vertical take-off and landing of their booster." That said, it's important to know the difference between the two companies their goals, and, most of all, their reusable rocket technology." "This feat raises some questions and some hackles, judging by SpaceX CEO Elon Musk's response to Bezos' announcement on Twitter, defending his own company's strides toward reusable rockets. Let's take a look at a few of the issues." By Keith Cowing on November 24, 2015 5:09 PM. "The delusion is thinking that SpaceX is going to lead the space frontier. That's just not going to happen, and it's not going to happen for three really good reasons: One, it is very expensive. Two, it is very dangerous to do it first. Three, there is essentially no return on that investment that you've put in for having done it first. So if you're going to bring in investors or venture capitalists and say, "Hey, I have an idea, I want to put the first humans on Mars." They'll ask, "How much will it cost?" You say, "A lot." They'll ask, "Is it dangerous?" You'll say, "Yes, people will probably die." They'll ask, "What's the return on investment?" and you'll say "Probably nothing, initially." It's a five-minute meeting. Corporations need business models, and they need to satisfy shareholders, public or private." "Private enterprise will never lead a space frontier," Tyson told me in a phone interview. "In all the history of human conduct, it's as clear to me as day follows night that private enterprise won't do that, because it's expensive. It's dangerous. You have uncertainty and risks, because you're dealing with things that haven't been done before. That's what it means to be on a frontier." 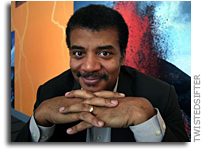 Keith's note: Neil Tyson may be a smart astronomer type of guy but he doesn't understand business - certainly not the model that is working for Elon Musk rather nicely thus far in SpaceX and elsewhere. Nor does Tyson have the resources that Musk has or understand why successful entities like Google have invested. Rather, Tyson's tactic on human and commercial space flight thus far seems to be to whine and inject doubt whenever he can. And he is clearly unhappy and grumpy when people continue to succeed in commercial and/human spaceflight. By Marc Boucher on November 24, 2015 1:11 PM. "Blue Origin's reusable New Shepard space vehicle flew a flawless mission--soaring to 329,839 feet and then returning through 119-mph high-altitude crosswinds to make a gentle, controlled landing just four and a half feet from the center of the pad. Full reuse is a game changer, and we can't wait to fuel up and fly again." Marc's note: Congratulations to the Blue Origin team. This is indeed an historic milestone in the history of flight. Now, how about providing some more details on the crew capsule and how it performed? "The successful flight keeps Blue Origin on track to begin commercial flights of uncrewed research payloads by the middle of 2016, a goal recently stated by company officials. Bezos told reporters he hoped to to start flying people on New Shepard in a couple of years, depending on the progress made during test flights. "As much as I would like to put humans on that vehicle and fly it as soon as possible," he said, "the reality is that we'll enter commercial operations withat that vehicle when we're ready, and not before." By Keith Cowing on November 23, 2015 9:06 PM. "The Formulation Assessment and Support Team (FAST) for the Asteroid Redirect Mission (ARM) was a two-month effort that NASA chartered to provide timely inputs for mission requirement formulation in support of the Asteroid Redirect Robotic Mission (ARRM) Requirements Closure Technical Interchange Meeting (TIM) in mid-December of 2015. 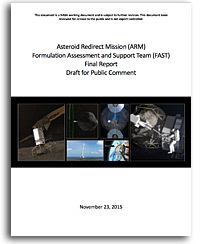 Following the ARM FAST's two-month study with 18 participants, NASA has released a draft report for public comment." By Keith Cowing on November 22, 2015 5:12 PM. "Kennedy Space Center Director Bob Cabana and other senior leaders were more involved than previously disclosed in illegal spaceport hires that may still be subject to federal investigation, according to records FLORIDA TODAY obtained through the Freedom of Information Act. Auditors found the hires of three administrative assistants supporting Cabana and two other high-ranking officials on the fourth floor of KSC headquarters suggested a deliberate effort to get around federal laws requiring competition and priority consideration for certain military veterans. "OPM's report also identified three illegal appointments in the Director's Office that I believed may have resulted from a willful intent to violate veterans' preference laws or to circumvent fair and open competition," NASA Associate Administrator Robert Lightfoot wrote last year in a "Letter of Counseling" to Cabana, referring to the results of a 2013 audit by the U.S. Office of Personnel Management. NASA records show Cabana identified and lobbied for three people who became known internally as the "primes," or prime candidates, to fill openings as his executive assistant and Deputy Director Janet Petro's secretary in mid-2012." Keith's note: I have to say that this article is an impressive piece of work by James Dean. Based on his good work, it would seem that this sort of flawed management behavior is totally acceptable at KSC - starting at the top. Remember the whole Ed Mango saga? You can be convicted of a job-related felony and still keep your job at KSC. So ... why is any of this other behavior surprising? Have a look at this 3 Nov 2015 internal KSC email - not only can you keep your job at KSC after pleading guilty to a felony, you get promoted. All, As most are aware Kathy Milon has accepted a position on a Source Board and will be leaving her position in C3 soon. I first want to express a heartfelt thanks to her for her dedication and commitment to the success of GFAST and the C3 Project; truly a great job in getting us as far as we've come. So thank-you Kathy! Ed Mango has accepted the challenge to lead the GFAS Team, with the transition to commence immediately. I know everyone will support Ed in this new assignment and we're fortunate to have someone of his experience ready to step in. This assignment will be for what's likely to be for a few months as we identify a long-term solution and phase that person in over time. Please join me in thanking Kathy and wishing her well, and welcoming Ed into his new role! Please pass this info on to your teams or forward as appropriate. Can Students Fix What NASA Can't? By Keith Cowing on November 22, 2015 2:43 PM. By Keith Cowing on November 21, 2015 8:52 PM. Keith's note: As if Orion with only a service module will be in Mars orbit. By Keith Cowing on November 20, 2015 4:24 PM. "NASA took a significant step Friday toward expanding research opportunities aboard the International Space Station with its first mission order from Hawthorne, California based-company SpaceX to launch astronauts from U.S. soil. This is the second in a series of four guaranteed orders NASA will make under the Commercial Crew Transportation Capability (CCtCap) contracts. The Boeing Company of Houston received its first crew mission order in May." By Keith Cowing on November 19, 2015 7:06 PM. "In 2013 The White House told NASA and other government agencies that they needed to make the results of their research more readily available to the public. In so doing the White House said that agencies needed to make research publications that had been available only for a fee available for free within 12 months of their publication. The public plaid for this science, the public should have access to it. ... NASA Deputy Chief Scientist Gale Allen was able to provide me with insight into this project. Their intent is ambitious, but if they pull off, NASA will have a substantially enhanced presence online in a way that a much broader audience will be able to access and utilize research results from NASA. Based on my discussion with Allen there is the intent to fully comply with the spirit and intent of what the White House has directed NASA to do." 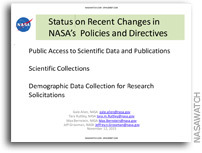 Keith's update: This presentation was delivered last week at NASA Goddard Spaceflight Center regarding NASA's plans to collect and post research data. Download. By Keith Cowing on November 19, 2015 12:16 PM. By Keith Cowing on November 18, 2015 11:58 PM. "As NOAA has endured a series of Congressional attacks this fall for its climate change research, the agency's administrator, Kathryn Sullivan, has largely remained silent. But the former astronaut's wingmate for two spaceflights, Charles Bolden, has not been so reticent. The NASA administrator this week continued to blister Congress for its tack on climate change science. After delivering a keynote speech on the commercialization of space at the SpaceCom conference in Houston Tuesday, Bolden talked to Ars about his own agency's Earth science research. He also addressed the efforts by Texas Congressman Lamar Smith, who chairs the House Committee on Science, Space, and Technology, to obtain the e-mails of NOAA climate scientists, in which Smith expects to find political influence and perhaps fraud." "Smith wrote that "Despite Dr. Karl's apparent awareness of these concerns, the study was moved to publication without the underlying data having been subjected to the appropriate reviews. More troubling, it appears that NOAA employees raised concerns about the timing and readiness of the study's release through e-mails, including several communications just before its publication in April, May, and June of 2015. These allegations raise serious questions about the Karl study and NOAA's public statements about its conclusions." "Unfortunately, the Chairman also used the hearing as a platform to continue his attack on NOAA's climate science. He said, "Another example of how this administration attempts to promote its suspicious climate agenda can be seen at NOAA. Its employees altered historical climate data to get politically correct results in an attempt to disprove the hiatus in global temperature increases." By Keith Cowing on November 18, 2015 1:43 PM. "The ambitious venture appears to be on hold, these officials said, because the Microsoft Corp. co-founder hasn't announced a replacement rocket supplier for the original contractor that dropped out months ago. At this point, project officials haven't provided even the broad outlines of technology that could be used in the future, a development timetable or how they plan to launch significantly larger numbers of smaller satellites than originally envisioned." "A month Two months later and the website still says "under construction". By Keith Cowing on November 18, 2015 12:08 AM. "Humans will become a multi-planet species by making it to Mars, but no farther. That is, they will never travel beyond Mars." Keith's note: While Planetary Society Co-founder Lou Friedman proclaims that humans will never go beyond Mars, a stunning video, posthumously narrated by Planetary Society Co-founder Carl Sagan, certainly suggests otherwise. I'm with Sagan on this one. Watch this video full screen with the sound turned up. Ad astra, y'all. Are CASIS Funding "Commitments" Just Smoke and Mirrors? By Keith Cowing on November 17, 2015 8:49 PM. Keith's note: CASIS is tasked to manage the portion of the International Space Station designated as the ISS National Laboratory. But other than NASA funding, CASIS has failed to attract any significant income other than that provided - by NASA. Yet they want you to think that people beating a path to their door with multi-million dollar "commitments" in hand. Exactly what are these CASIS "commitments"? According to the CASIS Strategic Plan, page 11, CASIS says that it will "Develop a robust financial model to supplement government funding. CASIS funding from NASA is currently projected at $15M per year, to cover operating costs and to provide seed money for promising R&D. To meet the variety of demands on personnel, infrastructure, business processes and outreach that will grow over time, CASIS must develop additional resources in the form of partnerships and funding and create rigorous business and economic models in order to sustain these. Sources will include private financiers, corporate sponsorship, philanthropists and federal grants that may leverage cost sharing and equity investment in new ventures. Additionally, CASIS will practice management excellence in its operating models to ensure costs are minimized while ISS utilization is maximized effectively toward mission success." In its April 2015 report "International Space Station: Measurable Performance Targets and Documentation Needed to Better Assess Management of National Laboratory" the GAO noted (page 7) "According to the cooperative agreement, CASIS will solicit non-NASA funding for research by targeting various sources such as government grants, foundation funding, charitable contributions, private equity, venture financing, and private investors and facilitate matching of projects that meet the research objectives with those qualified funding sources." So it is quite clear that CASIS is supposed to be out beating the bushes looking for funding and contributions. So far their success is puzzling to say the least. On one hand they claim to be making all manner of agreements and relationships with the private sector but when it comes to documenting actual contributions, well. There really are none - at least not the kind that a non-profit organization usually documents i.e. cash or in-kind donations. 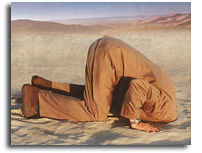 Continue reading Are CASIS Funding "Commitments" Just Smoke and Mirrors?. By Keith Cowing on November 17, 2015 5:17 PM. "Humanoid robots will be helpful to astronauts on our journey to Mars, so NASA has awarded prototypes to two universities for advanced research and development work." Keith's note: I asked NASA HQ and LaRC PAO how many colleges or universities submitted proposals. I was interested in how popular this whole idea was with universities across the U.S. Gina Anderson from LaRC HQ PAO replied "it's not our practice to share information about the number of proposals we received or which proposals were not selected." I replied "Its not your "practice", So, do I need to file a FOIA request? I am not sure why a simple number is not something that you'd readily supply. My interest is in how many school across the country were interested enough to try. I am not asking which schools they were." Gina replied "The program didn't provide that information. Here is the link to the FOIA page: http://www.nasa.gov/centers/langley/foia/index.html" My response "I asked NASA PAO how many universities/colleges applied - that's all - and you refuse to tell me because "the program didn't provide that information". Can't you ask them? I mean, that is usually why someone asks PAO." You are requiring that I file a FOIA. Is that what I am going to post? OK. (shaking my head)"
So .. I guess I will submit a FOIA request. By Keith Cowing on November 17, 2015 1:36 PM. Keith's note: Many people are pleased that the SPACE Act made it through the House yesterday. This legislation does a lot to support NASA's plans for going to Mars as well as various commercial efforts and things such as mining asteroids. There is something good in it for just about every space advocate. While a lot of individuals and organizations were quick to express their approval, others have been curiously silent. No statement seems to be available from the Coalition for Deep Space Exploration despite all of the things in it that directly support the organization's avowed interests in sending humans to Mars. Nothing from the Planetary Society either - yet their co-founder stated yesterday that "Humans will become a multi-planet species by making it to Mars, but no farther. That is, they will never travel beyond Mars." so ... maybe they are not as enthusiastic about this legislation. Curiously, the two Mars-oriented groups Mars Society and Explore Mars are silent too. Meanwhile on the Asteroid utilization front, the usually bubbly Space Frontier Foundation is silent as well. Why bother communicating to the public you purport to enlighten about space when important news like this happens, eh? Space utilization and exploration happens in spite of space advocates - not because of them. By Keith Cowing on November 17, 2015 12:44 PM. "House Majority Leader Kevin McCarthy (R-Calif.), House Science, Space, and Technology Committee Chairman Lamar Smith (R-Texas), and Space Subcommittee Chairman Brian Babin (R-Texas) today praised passage of crucial legislation that provides guidance and certainty for American commercial space partners. The bicameral, bipartisan agreement on H.R. 2262, the U.S. Commercial Space Launch Competitiveness Act, consolidates language from the House-passed SPACE Act with provisions from the Senate's commercial space legislation. It is now headed to the president's desk to be signed into law." By Keith Cowing on November 16, 2015 2:21 PM. "Humans will become a multi-planet species by making it to Mars, but no farther. That is, they will never travel beyond Mars. Some find this to be negativean absolute statement of limits and thus of giving up. My job here is to prove the opposite: humans exploring the universe with nanotechnology robotics, bio-molecular engineering, and artificial intelligence is something that is exciting and positive, and is based on an optimistic view of the future. ... Getting beyond Mars (with humans) is impossible - not just physically for the foreseeable future but also culturally forever." Keith's note: Yet another defeatist, robots-instead-of-humans op ed - this time by a founder of the Planetary Society. Indeed, he's afraid to even try. One quick look at the organization's "Humans Orbiting Mars" plan shows that they have to kill the ISS and avoid sending humans back to the Moon so that they can *almost" land on Mars. If this organization has its way humans will never leave low Earth orbit again. Friedman et al may be too afraid to try and go beyond Mars - back to the Moon - or elsewhere across the solar system - but there are many, many more people who relish the chance to do so. Keith's update: Lou Friedman posted a comment (comments section below). He chides me for not reflecting what his book says. DUH, Lou I never read the book. I never said that I had. I responded to your words as posted on the Scientific American website. If there is an "out of context" issue, Lou, then post your entire book online - otherwise, you wrote what you wrote. Don't expect people to be mind readers about what you meant to say - or said somewhere else. Based on your words you are quite clearly a defeatist when it comes to the human exploration of the solar system - a stance that the Planetary Society echoes. Funny how you seek to distance yourself from Planetary Society yet your Twitter handle is @TpsLdf. Just a coincidence, I suppose. By Keith Cowing on November 16, 2015 1:32 PM. "Genes in Space, a competition aimed at fostering creativity, collaboration and critical thinking among young innovators opened a call for entries today. The competition challenges U.S. based students in grades seven through 12 to design an experiment that can solve a space exploration problem through DNA analysis. The competition is sponsored by miniPCR, Math for America (MA), Boeing, The Center for the Advancement of Science in Space (CASIS) and New England Biolabs, Inc. (NEB). The winning experiment will be flown to the International Space Station (ISS)." Keith's note: If you go to the CASIS website there is no mention of this competition. There is no mention of this cool idea at the NASA ISS National Laboratory website. No mention on Twitter at @ISS_CASIS or @ISS_Research. When it says that CASIS has sponsored this activity does that mean that they wrote a check? $15,000,000 a year and CASIS can't even tell people what they are doing with all this money? CASIS is going to be briefing Mike Suffredini's replacement Kirk Shireman. Maybe they can explain their chronic under-performance to Shireman on simple things such as this. Keith's update: @ISS_CASIS tweeted something late in the day - still nothing on their website etc. By Keith Cowing on November 16, 2015 10:28 AM. "In the OIG's view, the principal challenge facing Agency leaders will be to effectively manage the Agency's varied programs in an uncertain budget environment. NASA's ability to sustain its ambitious exploration, science, and aeronautics programs continues to be driven in large measure by whether the Agency is able to adequately fund such high-profile initiatives as its commercial cargo and crew programs, Space Launch System rocket and Orion capsule, James Webb Space Telescope, and the personnel and infrastructure associated with these and other projects." "The underlying theme of this year's report is sustainability. Specifically, the OIG noted that NASA's ability to sustain its ambitious exploration, science, and aeronautics programs will be driven in large measure by whether the Agency is able to adequately fund such high-profile initiatives as its commercial cargo and crew programs, Space Launch System rocket and Orion capsule, James Webb Space Telescope, Mars 2020 Rover, and associated personnel and infrastructure." "Similar to last year, we noted that declining budgets and fiscal uncertainties have compounded the difficulty of meeting these and other NASA challenges. Finally, during FY 2014 the OIG will conduct audit and investigative work that focuses on NASA's continuing efforts to meet these challenges." "Throughout its 50 year history, NASA has been at the forefront of science and space exploration and the Agency's missions have resulted in numerous scientific discoveries and technological innovations. Unfortunately, in addition to their scientific accomplishments many NASA projects share another less positive trait - they often cost significantly more to complete and take longer to launch than originally promised." By Keith Cowing on November 14, 2015 1:05 PM. "Yes, once again the Hollywood Foreign Press with Fox's tacit approval has chosen to give a dramatic film with humorous moments the designation of a comedy. The move puts Ridley Scott's space adventure, which has now earned $200 million at the box office, in company with other dubious 'comedy' choices of the recent past, such as Martin Scorsese's The Wolf of Wall Street, Alexander Payne's Nebraska, and even the 2005 Keira Knightley-starring Pride and Prejudice. The comedy designation will offer both The Martian (and Joy, most likely) the ability to compete against lighter fare, including the Amy Schumer-starrer Trainwreck or the Melissa McCarthy summer hit Spy. It will also allow the Matt Damon-crowd pleaser to escape the stiffer dramatic competition, which will likely include heavier dramas such as Spotlight, Carol, and Steve Jobs. And for the Globes, it provides better odds that their star-studded affair stays that way, especially if Damon is nominated for Best Actor in a Comedy." 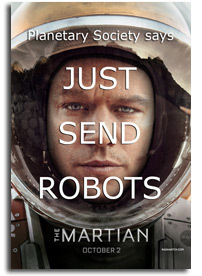 Keith's note: Interesting: NASA PAO unknowingly did a promotional tie-in with a space comedy film in pursuit of its own #JourneyToMars promotional campaign. That's not a first, though: they worked with "Sharknado 3" and "Armageddon" too. By Keith Cowing on November 13, 2015 5:52 PM. "NASA has named Todd May acting director of NASA's Marshall Space Flight Center in Huntsville, Alabama, as the agency continues the process of looking for a permanent director. Patrick Scheuermann, who served as the Marshall director since September 2012, is retiring from the agency, effective Friday. His retirement caps a 27-year career with NASA that began in 1988 as a propulsion test engineer at the agency's Stennis Space Center near Bay St. Louis, Mississippi." By Keith Cowing on November 12, 2015 7:31 PM. 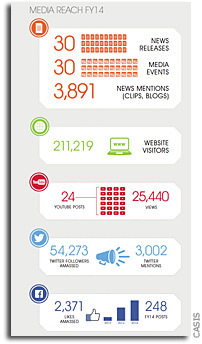 Keith's note: Let's look at the media reach CASIS claims to have achieved in FY 2014. 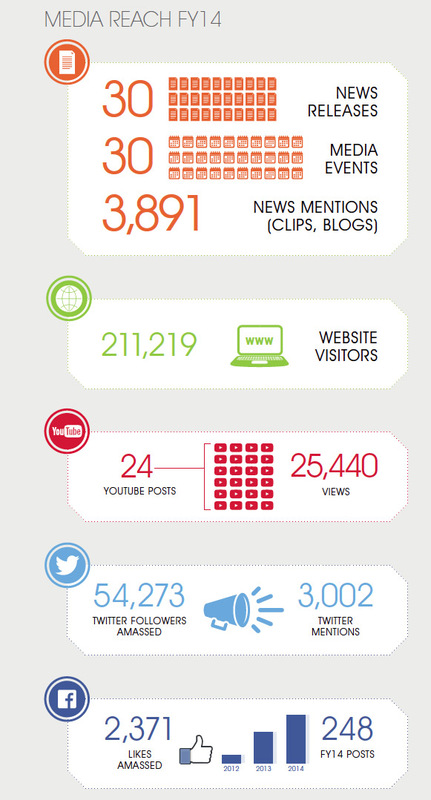 Page 32 of their FY 2014 Annual Report gives a summary (Larger image). This report represents what CASIS was capable of doing after being in operation for more than 3 years - after having received more than $42 million from NASA. Prior to this CASIS did not include these metrics in their reports. So this is the only snapshot we have. In this 2014 summary CASIS claims to have issued 30 news releases. That's one release issued a bit more often than once every 2 weeks. They also claim to have had 30 media events in FY 2014 but do not explain what constitutes an "event". This could be a telecon or a full blown press conference. Hard to tell. They also claim to have had 3,891 "news mentions - clips, blogs". If you go to this page and click on "Media Reach" you get a page that shows for 2015 CASIS has (first 3 quarters) had 18 press releases, 19 media events, 3,065 news mentions, and 2,711 Twitter mentions. Not much has changed. This is not very revealing. There are lots of news services that have automated systems that grab and repost press releases without any thought given to what the releases say. But the word "CASIS" gets counted none the less. 30 press releases automatically (and mindlessly) posted by several dozen of these automated systems each time one of these releases is issued could easily explain a large portion of these "news mentions". By Keith Cowing on November 12, 2015 2:59 PM. "In the old days, it [NASA] was great. Right now, we have bigger problems, you understand that," Trump said. "We have to fix our potholes. We don't exactly have a lot of money." Right now NASA receives roughly one half of 1% of the overall federal budget each year, amounting to about $18 billion allocated to the space agency for fiscal year 2015. Trump also made it clear that he is excited about the emerging private spaceflight industry. "You know, space is actually being taken over privately, which is great," he said according to a WMUR video taken of the event. "It's being taken over, a lot of private companies going up into space. I like that maybe even better." By Keith Cowing on November 11, 2015 12:01 PM. Keith's note: The American Society for Gravitational and Space Research is holding its 31st annual meeting in Alexandria, VA this week. Topics covered span the range of life science and microgravity research conducted on the ISS, on suborbital rockets, and on the ground. It is the largest such meeting of space station life scientists in the world. I covered yesterday's session on Nanoracks and Genelab and will be covering session on Thursday and Friday. By Keith Cowing on November 10, 2015 7:52 PM. "U.S. Senate Commerce, Science, and Transportation Committee Chairman John Thune (R-S.D. ), Ranking Member Bill Nelson (D-Fla.), and Space, Science, and Competitiveness Subcommittee Chairman Ted Cruz (R-Texas), and Space, Science, and Competitiveness Subcommittee Ranking Member Gary Peters (D-Mich.) issued the following statements on the passage of H.R. 2262, the U.S. Commercial Space Launch Competitiveness Act, a bicameral, bipartisan bill that encourages competitiveness, reflects the needs of a modern-day U.S. commercial space industry, and guarantees operation of the International Space Station until at least 2024. The bill builds on key elements in S. 1297 that the Commerce Committee approved earlier this year and passed the Senate on August 4, 2015." By Keith Cowing on November 9, 2015 11:37 PM. "Kerr traces his departure to a disagreement over a possible windfall for the Puerto Rico observatory. In late July, he publicly criticized the NSF for planning to cut its contribution to Arecibo if the facility began taking payments for helping in a private survey for signs of extraterrestrial intelligence. NSF officials say that his assertions were inaccurate and that its communication with Kerr never lapsed. Whatever the facts, some Arecibo observers see Kerr's exit as an ill-timed loss for a storied, but financially threatened, scientific facility that faces a murky future. ... In Kerr's telling, NSF officials told him that if Arecibo got funding from Breakthrough, its own funding would fall by the same amount. In a 29 July article, an angry Kerr told Scientific American that the NSF had placed Arecibo in an "unscrupulous" bind: walk away from the Breakthrough money or accept it and lose NSF dollars." By Keith Cowing on November 9, 2015 5:07 PM. "From possible ice volcanoes to twirling moons, NASA's New Horizons science team is discussing more than 50 exciting discoveries about Pluto at this week's 47th Annual Meeting of the American Astronomical Society's Division for Planetary Sciences in National Harbor, Maryland." "Scientists involved with NASA's New Horizons mission showed off the latest analysis of data collected during the spacecraft's flyby of Pluto in July, despite "organizational confusion" at the event that mistakenly prevented attendees from initially sharing the results with the public. However, that debate of the findings was initially limited to the people attending the meeting. Attendees of the morning conference sessions Nov. 9 were told that the results were embargoed until a midday press conference. This prevented both scientists and reporters from sharing the results presented in those talks to the public, including through social media, much to the consternation of some in attendance. Sources at the conference blamed the embargo on NASA, in contrary to the conference embargo policy established for conferences run by the American Astronomical Society. Niebur said later that the embargo was a misunderstanding that won't apply to other sessions during the week-long conference. "There was some kind of miscommunication," he said. "There was a little bit of organizational confusion." "What is the purpose of these embargoes if NASA is just going to play games with access to the embargoed news? And why does it allow a magazine like Science control how taxpayer-funded news is released?" By Keith Cowing on November 5, 2015 4:30 PM. "NASA is currently spending money on its key exploration programs at a rate that assumes Congress will approve a budget increase in the next month, a move that could delay some efforts should the additional funds not materialize. Bill Hill, deputy associate administrator for exploration systems development, told a meeting of the NASA Advisory Council's human exploration and operations committee here Nov. 4 that NASA was funding programs like the Space Launch System and Orion spacecraft at a higher rate than specified in the continuing resolution (CR) currently funding the agency. "Today we're running hot. We're running based on what we saw in the draft House and Senate levels," Hill said. "But if we don't ultimately achieve those levels in an appropriations bill, then we'll have to power back and replan." Keith's note: Of course the flip side of this is the equal expectation within NASA that its commercial crew and/or cargo efforts will be shortchanged in the budget thus delaying progress, reducing capability, and driving up eventual long-term costs. Punting on the CRS-2 decision gives NASA time to do a lot of things - including waiting until they see how much money they have. If the commercial crew budget gets cut too far there will be renewed pressure to downselect to one provider. By Keith Cowing on November 5, 2015 2:28 PM. "(Science and Geophysical Research Letters embargoed details until 2 p.m. EST Nov. 5) NASA will provide details of key science findings from the agency's ongoing exploration of Mars during a news briefing at 2 p.m. EST on Thursday, Nov. 5 in the James Webb Auditorium at NASA Headquarters in Washington." Keith's 4 Nov 11:00 pm note: What a tease. NASA is clearly dropping a hint - to over 13 million people - complete with an illustration - about its own research news - news that is supposedly under embargo - until Thursday at 2 pm EST - news that they have already given to hand-selected news media ... why even bother with an embargo? "NASA's Mars Atmosphere and Volatile Evolution (MAVEN) mission has identified the process that appears to have played a key role in the transition of the Martian climate from an early, warm and wet environment that might have supported surface life to the cold, arid planet Mars is today." Keith's 5 Nov update: Of course NASA looks the other way when some media (but not others) are given advanced access to NASA mission results and they also openly allow media to interview mission personnel, etc. in advance about these results such that fully written articles appear online 1 minute after the embargo lifts. Meanwhile NASA teases everyone about this news in advance by parting the curtains on the pending news and hyping it via social media. What is the purpose of these embargoes if NASA is just going to play games with access to the embargoed news? And why does it allow a magazine like Science control how taxpayer-funded news is released? By Keith Cowing on November 5, 2015 11:26 AM. "Increased political scrutiny may provide an incentive to NASA to add more contractors to provide "back-up options" and avoid protests by losing bidders, said Nick Taborek, an analyst with Bloomberg Intelligence. NASA isn't expected to gain additional funding from Congress, however, so adding new participants would probably mean less money for the current cargo haulers." Keith's note: Despite articles like this and others, I detect no indication that a CRS-2 announcement is imminent i.e. today. PAO usually waits until the last minute but they do give media a heads up. As best we can tell SpaceX, Orbital ATK & SNC are in CRS-2 competition but Boeing is not. But SNC needs a ULA launcher. By Keith Cowing on November 3, 2015 11:01 PM. "Two years ago I spoke to this conference and told you that we need to fly soon and fly often. We need to figure out how that can be done. Today we are not two years closer to the first human flight of our exploration systems. If anything we are farther away. No wonder I'm frustrated. If we are honest with each other, then we will acknowledge we are all frustrated. In our frustration it is natural to try to place blame somewhere. John Adams once famously remarked that 'One disreputable man is a disgrace; Two disreputable men are a law-firm, and Three or more disreputable men are called a Congress." Ho ho ho. We all like that. But listen to me: It is not the Congress's fault we are where we are. If anything, they are accurately representing their constituent's views. Do you want to blame the President? It is not the President's fault. Do you want to blame OMB, OSTP, the Big Aerospace Corporations, the little New Space disruptors? It is easy to point the finger and blame somebody else. But I am here to tell you all in the family now that they are not to blame. If you want to know who to blame, look in the mirror." By Keith Cowing on November 3, 2015 11:00 PM. By Keith Cowing on November 3, 2015 11:13 AM. "NASA announces its annual invitation for public nominations for service on the NASA Advisory Council's Science Committee subcommittees. Five science subcommittees report to the Science Committee of the NASA Advisory Council (NAC), a Federal advisory committee under the Federal Advisory Committee Act (FACA). U.S. citizens may submit self-nominations for consideration to fill intermittent vacancies on these five science subcommittees. NASA's science subcommittees have member vacancies from time to time throughout the year, and NASA will consider self-nominations to fill such intermittent vacancies. Nominees will only be contacted should a vacancy arise and it is judged that their area(s) of expertise is appropriate for that specific vacancy. NASA is committed to selecting members to serve on its science subcommittees based on their individual expertise, knowledge, experience, and current/past contributions to the relevant subject area." By Keith Cowing on November 3, 2015 8:56 AM. "The National Aeronautics and Space Administration (NASA) Human Research Program (HRP) is establishing a Translational Research Institute. The Institute is aimed at translating promising cutting edge human health and performance methodologies into validated space flight human health and performance prediction, prevention, monitoring, detection, maintenance and treatment capabilities for exploration missions. In addition, the Institute will provide a translational workforce, providing opportunities for scientists to propose new NASA research, gain experience in cutting edge research laboratories within and external to NASA, and apply their knowledge and expertise to reducing human exploration risks. The Institute will be a virtual institute (no brick & mortar) responsible for the solicitation, selection, funding, and translation of results from interdisciplinary project teams." By Keith Cowing on November 3, 2015 8:38 AM. Keith's note: The music in this official "He Haw"-style shout out is the theme from the old TV show "Beverly Hillbillies". I do not see that it is credited to writer/composer Paul Henning. Just sayin' Y'all come back now. By Keith Cowing on November 3, 2015 8:19 AM. Gee @DittmarML how you can work simultaneously for #NASA contractor @ISS_CASIS lobbying group @XploreDeepSpace & advisory org @NASciences ? 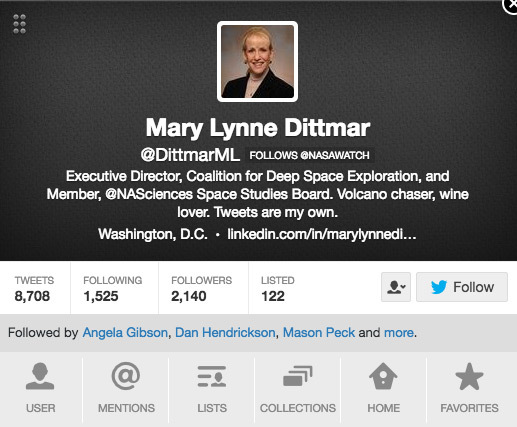 Well @Astro_Box Don't you think it would be proper to tell people that new Ex Dir of @XploreDeepSpace @DittmarML is a @ISS_CASIS employee? Keith's 3 Nov 12:19 am note: Have a look at Mary Lynne Dittmar's LinkedIn page (screengrab). It clearly says that she is a CASIS consultant "January 2015 - Present". She openly advertises this LinkedIn link on her Twitter profile (screengrab). Apparently the information on her LinkedIn page is inaccurate. Was she an "employee" of CASIS? No, she was a "consultant" - my error - and I am sorry for that mistake. But she was (and based on her email below, still is) paid by CASIS to perform work. That's the point. She clearly updated her LinkedIn page to include her new job - but left the CASIS consulting description as it was i.e. ongoing. I am not sure why I should apologize for assuming that this information was anything other than accurate. She sent this email (below) which I am posting in its entirety. I asked her via Twitter how she could do all these things and she has responded. Keith's 3 Nov 8:20 am 3:30 11:30 pm update: Dittmar's LinkedIn page still says that she is currently a CASIS consultant. Keith's 4 Nov 7:30 pm update:: It s still there. As for the CASIS "contractor"issue, CASIS gets 99.96% of their funding from NASA and there is a contract in place whereby those funds are provided. As for the Coalition for Deep Space Exploration and lobbying the press release announcing its creation overtly stated that it intends to pursue 501(c)(6) status from the IRS. 501(c)(6) organizations are permitted to do unlimited lobbying - so long as that is not the primary purpose of the organization. Otherwise, you'd expect it to seek 501(c)(3) status. As for "internal documentation" it is "internal" - so how does someone on the outside know what it says? Continue reading Less Than Full Disclosure at CASIS (Update).